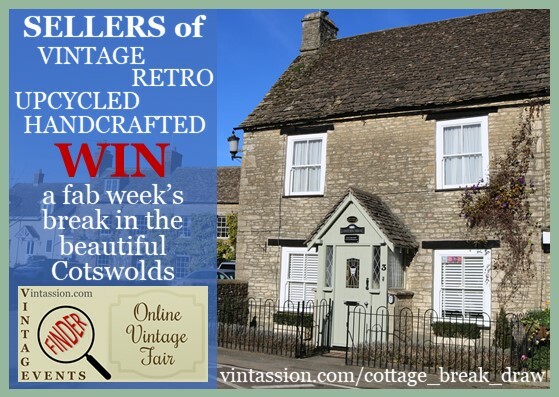 Win a Week's Cotswold Break for up to 5 people if you Sell Vintage, Retro, Upcycled & Handcrafted! If you are not already an Online Vintage Fair seller you can register anytime during the draw entry period for the no tie-in 30 Day Free Trial and start listing! ...it has 4 bedrooms (double, twin, single and a purpose equipped nursery bedroom with black out blinds), all with beams and quality pocket sprung mattresses with white cotton bed linen. Sherston's location in the South Cotswolds means it is ideally situated for Lacock (beautiful National Trust village where Cranford, Pride & Prejudice, and Harry Potter have all been filmed), Castle Coombe (another beautiful village where War Horse and Dr Dolittle have all been filmed), and Westonbirt National Arboretum with one of the most spectacular tree gardens in the world is only 3miles down the country lanes. To find out more information about Lantern House and what to see and do in the beautiful Cotswolds please visit Lantern House's website. Registered Vintassion sellers shall automatically be entered into the draw for every item they have for sale and/or marked as sold on their Online Vintage Fair stall during the draw entry period 18th January to 29th April 2019 inclusive. Therefore the more items a seller has for sale (and sells) increases their chances of being drawn the winner! For entries to be valid registered Vintassion sellers must ensure their Online Vintage Fair Stall Selling Period is active on the 29th April 2019 and they have a minimum of 5 items listed for sale. The draw will be done using a computer to randomly select the winning entry. This web page shall announce anonymously when the winner has been drawn (on or before 6th May 2019). The winner must make their booking direct with Lantern House Holidays and take their break before the 20th December 2019. Lantern House Holidays booking arrangements and conditions shall apply when making this booking. The winner cannot pass on or sell the weekend. If the winner is unable or does not wish to book Lantern House no alternative prize will be offered.